Mom received a call from another doggy mommy, Dou Dou Mom asking her if she knows of any animal rescue organization because she found a skinny pug outside the convenience store. She asked mom to bring a spare leash over and she gave the pug some food. 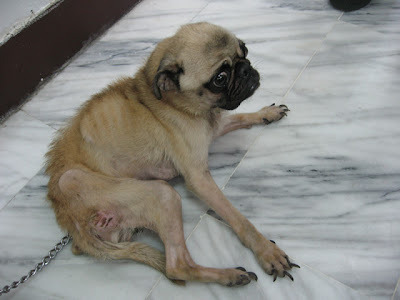 This is the poor pug, they have never seen any pug as emaciated as this one. He is all skin and bones and there are some sores on his bum, vet says he was probably kept in a cage without any care for a long time. How cruel! Vet says he appears healthy and is about one to two years old. He also did not have any ID tags or microchip on him. Vet took his blood to run some tests. Phew! 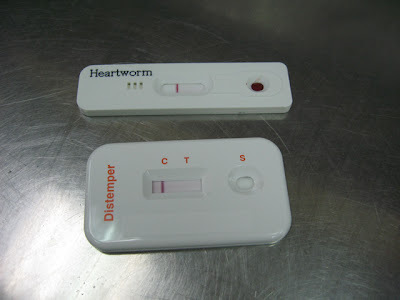 He tested negative for Heartworm and Distemper. That is good news, but sending him to the shelter may not be a good idea at this point because he is unlikely to be adopted by anyone within seven days and so, Dou Dou Mom decided to bring him home. Yippee! 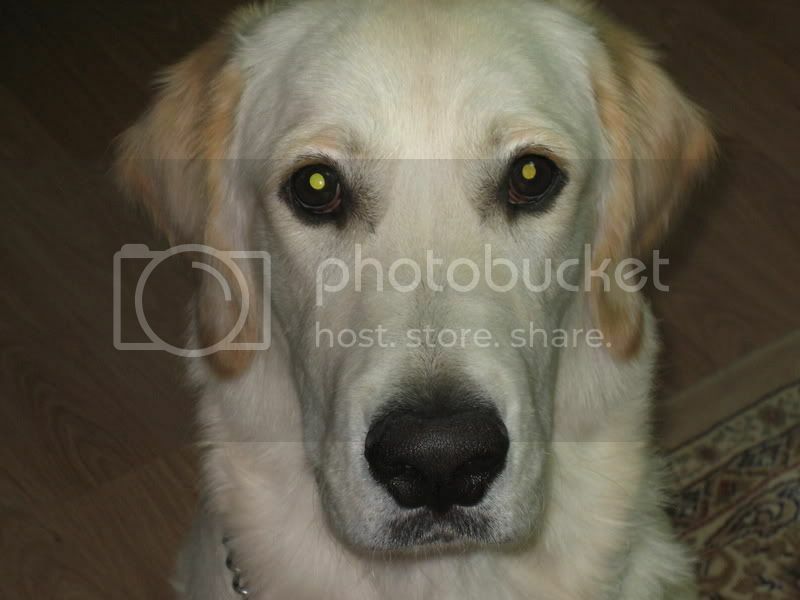 Dou Dou the three legged golden retriever is going to get a new playmate! Here is Puggy after a bath. Look at his trimmed nails! The groomer even put a yellow scarf on him! For an update on Puggy, please go here. I don't understand how the human mind works sometimes. How could somebody abandon their loyal companion. Your mom's friend had a heart of gold. A true animal lover. Lets hope the pug finds a forever home. Aiyooohhhhh!!!!! What a terrible shape that poor Pug is & he's sooo emaciated. I've never seen one all skin & bones before too. That raw sore on his bum area looks like maggot holes. Similar to the ones to the dog my hoomans rescued but luckily her's was not as big as his but still, there was over 10 maggots in there. I bet he feels sooo much better after his nails were trimmed & bathed. Now all he needs is to get back to his healthy weight, love, care & affection & his cruel owner to be fined & jailed. He'll transform back to a bootiful Pug in no time just with a little bit of TLC. Good job to your hoomans for taking him in. Dino, your mummy and your mum's friend are special angels. U girls have big big hearts! omg, how come people can be so cruel to him!! 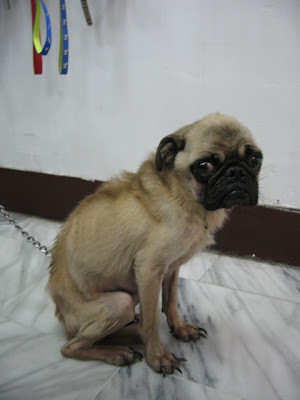 so piss off.. i never seen a skinny pug like this.. pug always fatfat,, sigh,, look at his face,, full of fears. That poor little guy! I'm glad someone was able to rescue him! Oh gosh, what a sad little thing! Some people are so cruel and heartless, it makes me ill. Hooray for your friend for taking in the little guy--please post an update when he is fat and happy! What a cute pup, it breaks my heart to see a pup so neglected. You are true angels for saving the little one! We hope puggy finds a good home. Please keep us updated. Looking at the picture of this poor puggy made my mom cry. How can someone be so cruel?? Glad he is not sick. 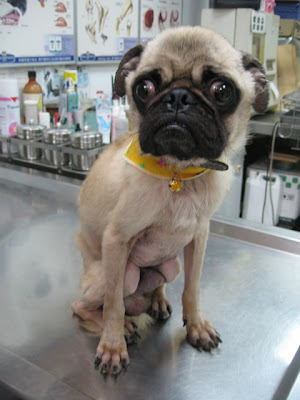 With lots of love and good care he will be a handsome pug again! I hope you can find a lovely home for him. Please please find a good home for the poor puggy. I have two pug brothers, I've never seen any doggy that bad shape. Thank you for giving that puggy love and good care, oh my eyes leak already, can't type anymore! Bless you for your caring heart and for taking in this precious pug. We volunteer for pug rescue here in Dallas - www.dfwpugs.com and the best thing you can say is this is the first day of the best part of this little baby's life - the day he found you. Please give him hugs and love for us, your friends in Texas. I came over immediately after hearing about this little pug from my friend, Mango. How sad, but how wonderful that he will have a great new home! My friend JB told me that you had found this poor pug. It is so wonderful of your family to take him in. His pictures made us cry too and we don't understand how humans can do these things. Thank you for rescuing this fella, and I hope he can find a forever home soon. It is nice to meet you, I hope it's ok if I come back and visit again. Ane, Bajas the Pug and Virus the Devon Rex. My mom and I are so happy you're adopting Puggy! My mom says if she lived closer she'd adopt Puggy and show him so much love that he'd forget the first 2 years of his sad, hungry life. We are sooooooo happy for him! Oh! I misunderstood! Dou Dou's mom is adopting Puggy! Dou Dou only has 3 legs?? My cat sister Libby only has 3 legs too! Does Dou Dou have a blog??? Hi! It's Pedro again. My mom woke up thinking about Puggy again this morning and she started getting all teary eyed when she was telling my dad about him. She made my dad read your story. We really hope Puggy gets healthy again and has a very happy life. My mom says it hurts her so much when she hears about animal abuse. What kind of person would spend good $$ on a dawg just to abuse him to near death???? Again, we are so happy you helped him and we'd love to know how he's doing. Puggy now has a special place in our hearts. Oh the poor, poor Pug!! That is so awful, Dino! I have never seen such a thin, sad-looking Pug. Thank goodness you and Dou-Dou have such lovely humans - I really hope that it gets better soon; at least it is in a wonderful new home now! You don't want to know what I'd like to do to the humans who abandoned it!!!!! Yes, you can't save them all, but you do what you can. And evidently you do a good bit. That little dog is in terrible condition and whoever abandoned it should be ashamed! But unfortunately, those people seldom are. This one got lucky. We're glad you took him in. He will probably end up being a great blessing to you. oh.. we are saddened with this whole thing. 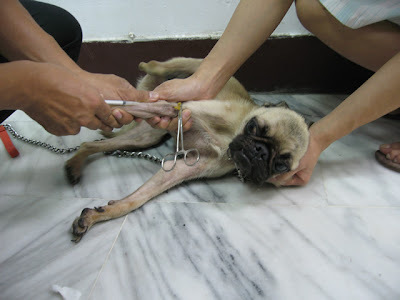 but we are also grateful that you were able to 'help out' this poor pug. In the Philippines, animal abandonment is also a common scene. we cringe at the growing number of abandoned animals. if only manang were rich, she can afford to care for all of them. we hope the pug will be able to find his furrever home. we can sense that he is in the company of wonderful, caring and responsible hoomans, and we know that he will definitely recover from his horrible past. OMD! Mom and I got so sad listening to the story of this poor dog, but fortunately he found angels as your Mom and Mom´s friend who took care of him. I hope the pug gets better soon and he has a wonderful life. Thank you all so much for your concern about Puggy. His appetite is good and his body has filled up a bit, but he has been having diarrhea. Dou Dou Mom is bringing him to the vet. Will keep you all up to date. Thanks once again for all your well wishes and good thoughts, please pray for the little pug and give your own pups a scratchie today. Hi would you be kind enough to update us on the little boy pug please. I was heartbroken to read about him and see those terrible photos. I thank you from the bottom of my heart for helping him and I am hoping that he is doing great now. Thank you for the update. I am delighted to hear puggy, now named Seven is doing real great. Words can not discribe how wonderful it was to see Puggys video clip and photos. I see 2 years has passed, is everything allright and is the puggy doing well? OMG... I just want to scoop him up and love him, and tell him everything is going to be all better from now on!!! The poor sweetheart! 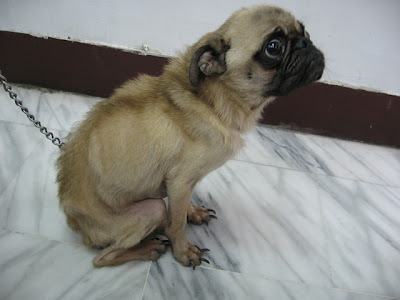 How could anyone ever let this happen to a pug!? My pugs are part of the family, and IMO hte best dogs you could ever ask for. So loving, and wonderful... It jsut breaks my heart to see him. I am so glad you guys have given him a home. Would love to see updated pics on how he is doing! Bless you for taking him in and showing him what real love is! This breaks my heart!!!! I just want to scoop him up and cuddle him so he knows someone loves him. Dino don't like a pug in that picture. I feel sorry for him. I'm wondering how is he doing? I hope Dino is doing well. This post was from a while back, can you give us an update on Dino? Hope he is well.